Our approach to winemaking has remained constant since our first vintage. 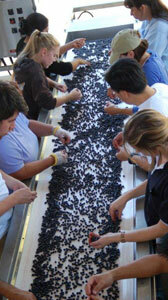 We inspect every grape after it has been removed from the stem. We discard every one that doesn’t meet our standards; typically sacrificing six to eight percent of our fruit during this process. From that stage on, every wine is crafted to maximize balance and textures. Each of our vineyards imparts their fruit with such pure flavors that we strive to bring all of the components into harmony. All of our wines are aged in new French barrels, including Remond, Francois Freres and Gamba for our Syrahs and Darnajou and Taransaud for Cabernet Sauvignon. We evaluate each barrel of wine biweekly, allowing the wines to dictate to us how they are treated in terms of racking, barrel stirring, sulfur additions and bottling. While we are not open to the public, we enjoy hosting private tastings at our winemaking facility. Please contact us if you’d like to arrange a tasting.